I do not know what this means. This phrase is not any of the Passpoint Express documentation. The Host ID is the number that is assigned so the panel could not be connected to by a computer that did not have the same ID # .It is described on page 12 of the quick start guide. You can find out what it is by clicking Config, then System Wide Options. Look under the Network/ID tab to see what it is. The default is FFFFFFFFFFFF. If the settings in the panel and software do not match, the panel won't permit the software to connect. I have a text file that tells you how to connect with hyper terminal, but it will only allow you to default the panel, not view the current settings. Does anyone else have access to this computer? Someone with more curiosity that common sense? Is there a second serial port? In that same setup window, there is a port option. That is the serial port it's connected to. If you have another, my first idea would be to try that second serial port to see if you can connect. If not, you could add a USB-serial adapter (The Tripp Lite USA-19HS is one of the listed adapters that the manufacturer recommended) set that to a port and test that. There could be a problem with the cable itself, perhaps if it got pinched. Lastly there could be something wrong with the MLB. If you have the software and access to another computer with a serial port, there's another way to test. 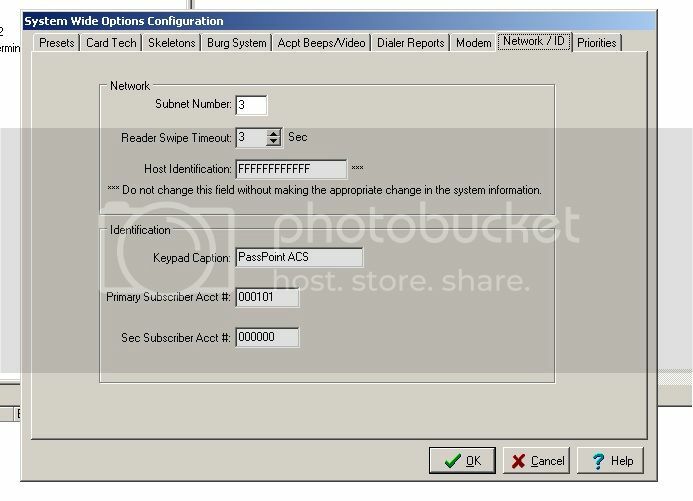 Once you install the software, copy the contents of the Data folder in the install directory (C:\Program Files\Ademco\PassPoint Express usually) from the existing PC to the new test one. Thank you for your thoughtful and insightful response. I would love to use my laptop to cannot, but I cannot find the install disk. The location is a bank, which had been in foreclosure and unused for 2 years. The card readers still give us access, so the system appears to be operational. Now that my boss owns the bank, we need to add some readers and make some changes. I will try everything that you mentioned. Do you know any way I can get the software to load on my laptop? Thanks! Also, we may need to add more readers. Do you know if Passpoint Plus hardware is compatable and available? It's possible the user you log onto the software with had limited visibility. If you aren'y already, try loggin in as the installer (default user name and password is "installer"). I've included photos just to make sure, here, and here. I also have a copy of PassPoint Plus as a disc image here. The software is virtually identical, so there's zero learning curve. The hardware is the same no matter which version of the software you're using. The Pass Point family is no longer listed on Honeywell's websight, but I've seen listings on the internet to buy parts. Thanks, again for your insight. When I tried to login as 'installer', the default password 'installer' did not work, so someone must have changed the password. Is there a way around this? I made the Installation CD, but if I load it on my laptop and connect to the panel, will I wipe out was has been setup? If so, maybe it won't be a bad thing, as long as I am able to reassign cards/doors etc. I am just afraid of losing what functionality we now have. I need 2 more card readers, but I cannot find Passpoint Card Readers for sale, anywhere. Are these readers special, or can I use another brand Prox Card Reader? Thanks! I know of no way to bypass the installer password. 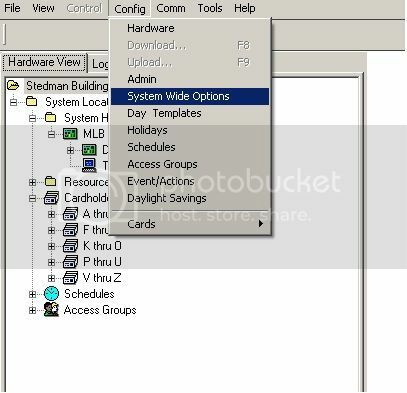 If you install the software on a different computer, there is an option in the wizard to connect to an existing panel and upload all information. I'm not thinking that will be necessary, I'm guessing there is a problem with the serial port (which seems likely, someone who DOES have access (installer level password) changed the Host ID on that computer, or there's a hardware failure?). You can use any HID reader. HID made the readers for PassPoint, and they just stuck their sticker on. In fact, one of these will probably look quite familiar. I loaded your copy of Passpoint Plus on my Vista laptop. It seemed to load, OK. But, when I tried to launch the main Passpoint Plus app, the app never completed opening. I could see it in Task Manager/Processes. I don't know what it was doing, but it kept using around 50% of my CPU resources, per Task Manager. However, it never showed up in Task Manager/Applications and the main Passpoint Plus application never opened up. I tried the other Passpoint Plus applications, such as User Configuration Utility, Report Scheduler and Help and they Opened up, OK. I tried rebooting my laptop; no help. Do you have any suggestions? Today, I uninstalled Passpoint Plus and then, reinstalled it. The main Passpoint Plus app still does not open. It is doing the same as yesterday. My laptop is a Toshiba running Vista SP2. Do you have any ideas why the app does not open? Thanks. ... The main Passpoint Plus app still does not open. .... My laptop is a Toshiba running Vista SP2. Do you have any ideas why the app does not open? Good news! I tried loading Passpoint Plus on my XP PC and it seems to work. Must be something it does not like about Vista. Now I will drag my PC to the job and try to connect to the panel. Good deal. That is what you get with older software sometimes, in spite of the talk about backwards compatibility. Making the leap to a Vista or a Windows 7 (or beyond) can cause real issues. Kudos to SpywareDr for spotting that and making the connection. When I tried to Load and Run Passpoint Plus on my XP PC, it worked, OK. There must be something about Vista. Then I brought my XP PC from home to the job site and I was able to connect to the panel. You were right about the Host ID Mismatch problem. Following your directions, I was able to reset the Host ID to FFFFF. Everything seemed to work, but when I tried to Enable some Disabled cards, or when I tried to Add new cards, those cards would not release the door strike. Instead, I get error messages that the card is not assigned to Account Group. Of all the cards I have, there is only one that releases the door strikes. I tried to Disable and then Enable that card and it responded as expected, so I know that I can control at least one card. My next step is to re-load Passpoint on to the original PC, but I don't see how that will make any difference. Do you have any suggestions as to what I must be doing wrong? Do you perhaps mean the cards are not assigned ACCESS groups? In the card database (Config, Cards, Browse Database), on the "Access" tab there is a place to assign up to 5 access groups. This is where the card is given permission to unlock certain doors at certain times. Going to the Access Groups configuration (Config, Access Groups) it's a reasonably straight forward set of tabs that show you which doors they have access to and what time for each group. Thanks for your reply. The cards appear to be assigned, at least one Access Grp and when I look at what the Access Grps can do, it all appears to be set up, properly. I do not know if this has anything to do with my problem, but, at this time, I am connected, using my XP PC, from home. Using the same Account Name/Acct# from the original PC, I was able to download the data from the panel. So, I am working with the data that was downloaded from the panel. (I did not transfer any data from the original computer). The data appears to be the same. BTW, the original PC is a W98, not XP. Do you think that I can Load your Passpoint Plus CD right on top of the original Passpoint Express software? When I go back to the job site, I will photograph a couple screen shots, that seem to be involved, and send them to you. I tried to open the link for the passpoint SW download. It works but the SW is Norton Ghost 15. It's a disc image. It can be mounted by a virtual CD drive program (I use Virtual CloneDrive), or you can use a CD burning program to burn it to a physical CD.